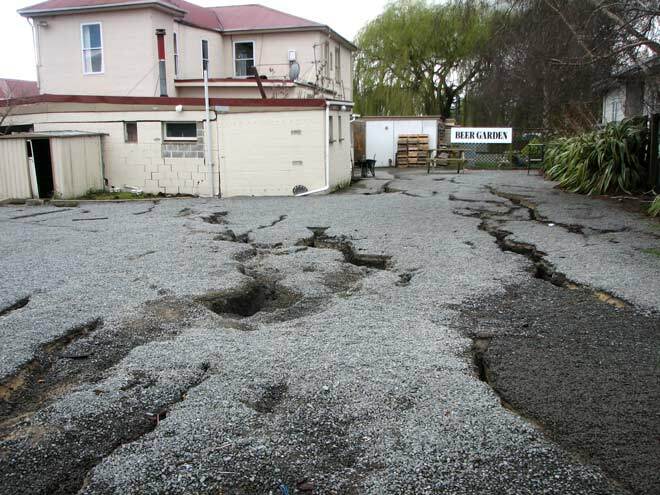 Lateral spreading – where the earth literally is pulled apart sideways – occurred in Kaiapoi during the Darfield earthquake, as seen in this parking area of a tavern near the Kaiapoi River. The concrete blocks in the wall at middle left have also separated due to lateral spreading and uneven ground settlement. Kaiapoi was one of the worst-hit areas. Buildings were damaged due to the severe ground shaking combined with the underlying geology of saturated fine sand and silt – which turned into a jelly-like consistency during the earthquake.